And yes, it could be a hybrid. Bugatti may not have had any new cars to reveal at this year’s Frankfurt Motor Show, but its presence was certainly felt. Even with the F1-powered Mercedes-AMG Project One stealing all the spotlight, Bugatti reminded us that it can still set new benchmarks in performance. As if we needed reminding that the Chiron is ridiculously fast, the hypercar broke an incredible new speed record, reaching 0-249-0 mph in just 41.96 seconds. And yet Bugatti is already busy planning the Chiron’s future replacement. At the show, CEO Wolfgang Durheimer hinted at what lies ahead for Bugatti and when the Chiron’s future successor will start development. Road and Track reports that there’s still a lot of demand for the Chiron. "Chiron will be with us for quite some time. It is supposed to sell for six years—right now we have a waiting list of four years," Durheimer confirmed. He also announced that the 300th customer Chiron has been sold out of the 500 planned for production, and that 70 Chirons are produced every year. “We are not increasing the volume. So the question, what is the next one, needs to be answered in 2019,” said Durheimer referring to the Chiron’s replacement. “Next year is a pre-development year where we evaluate the different ideas." Durheimer has previously stated that Bugatti’s next hypercar will be electrified. After all, the Chiron is surely pushing the very limits of mechanical performance, so electrification seems like the next logical step to extract even more power – particularly when its rivals are actively embracing hybrid technology. However, his comments at Frankfurt regarding an electrified Bugatti seemed less certain. 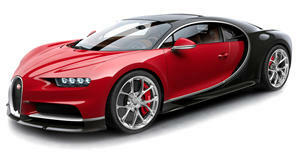 "Electrification also might be a topic for Bugatti," he said. "It's not decided yet, but we have interesting alternatives. The race will go on. We will go faster, quicker, and be better in every dimension."